Coolamon Sapphires' are produced by Coolamon Mining Pty Ltd, a family company owned and operated by Jim and Jenny Elliot. Coolamon Mining operates on the Central Queensland Gemfields, based on the townships of Sapphire and Rubyvale some 50 kms west of Emerald, and on the Lava Plains field in North Queensland, from which the very high grade "Undara" blue sapphires are obtained. Coolamon Sapphires' are proud to offer to the Jewellery manufacturing trade a selection of top quality sapphires in a range of natural colours. We cater to both small and large jewellers who expect and appreciate quality. We are able to offer gems of such high standard because we have control over the mining, grading and faceting process. This close involvement gives us the opportunity to select those rare and exceptional gems. Our prices for the stones we offer represent excellent value, as by dealing with us you are buying direct from the producer. Jim and Jenny became involved in sapphire mining nearly 20 years ago as producers of rough sapphire only, but have now expanded their business to be able to offer cut stones in a very comprehensive range of shapes and sizes and a remarkable "Rainbow of Colours". While about one quarter of the total production is gem quality, only about 2% of the very best material is kept for cutting and sale. The colours of Coolamon Sapphires are totally natural and the standard of cutting is very high. 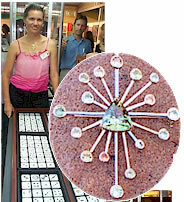 Coolamon Sapphires are quality gems for those who appreciate the best.